Goat cheese gnudi with basil. I made homemade ricotta about a month ago and had a much higher yield than expected. In looking for ways to use it up quickly, I learned about gnudi, which are similar to gnocchi but have soft cheese, usually ricotta, in place of potato. They are delightful, golden brown and slightly crisped on the outside and soft in the middle, like dumplings. Gnudi can be served with just about any sauce you ever put with pasta; we tried brown butter with herbs and spring vegetables and a red sauce with garlic and basil and couldn’t decide which was our favorite preparation. Last night, as I looked into my sparsely-populated fridge and tried to come up with an idea for dinner, I remembered that I have some goat cheese to use up before I go on vacation. 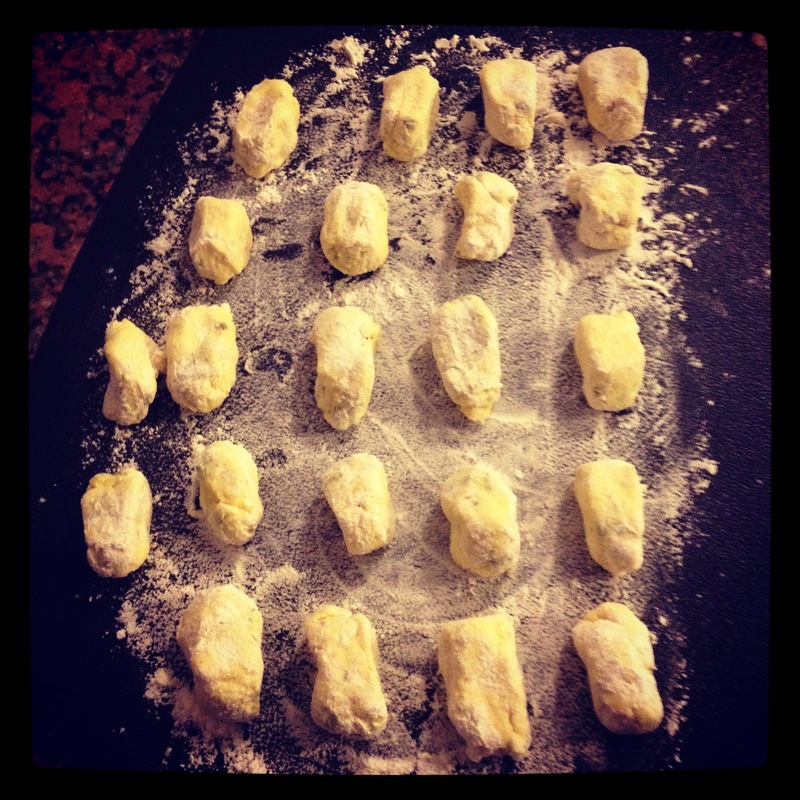 Light bulb moment: chevre is so similar in consistency to fresh ricotta– why couldn’t I substitute it in and make gnudi? Well, I did, and I think it worked beautifully. If you’ve looked ahead to the recipe, you’ll see that it is so simple, more about waiting and being patient than any sort of complicated ingredient list or process. I chose to add basil but you can leave it out or sub in another herb of your choice, and the sky’s the limit when it comes to choosing a sauce. This recipe serves two adults (about 11-12 apiece) but can very easily be doubled or tripled. 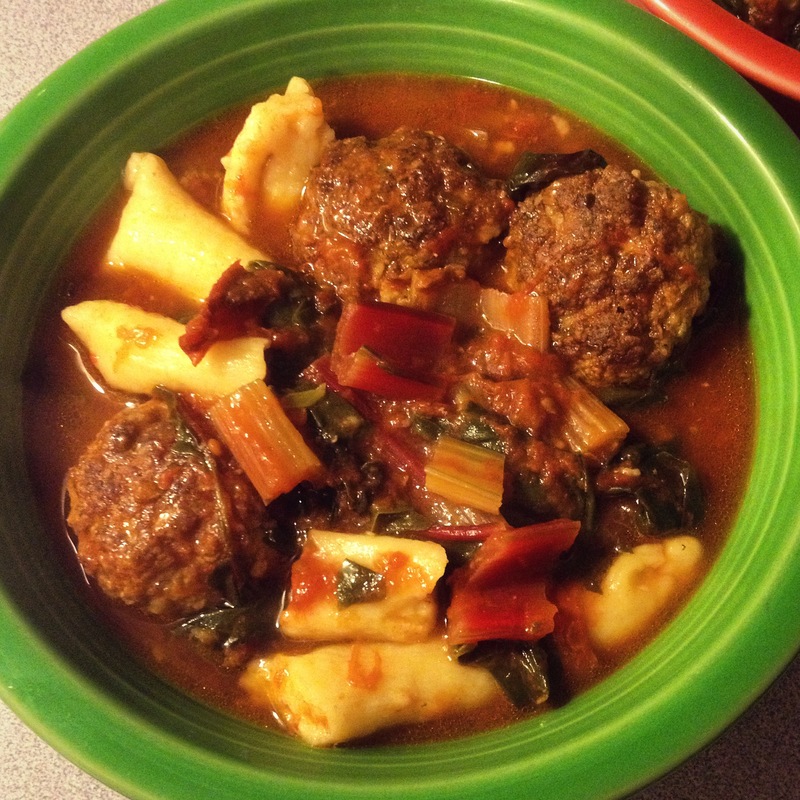 Gnudi are an easy, fun-to-prepare, delicious and versatile dinner option. To prepare the dough, mix together the goat cheese and egg until you have a smooth mixture; add basil, salt & pepper. Stir in 1/4 c. flour, half of the amount at a time, until incorporated, but don’t overmix. I know that sounds somewhat contradictory: you don’t want to dump the flour in all at once, but you also don’t want a tough, overworked dough, so don’t involve a mixer and stop stirring as soon as the flour is no longer visible. The dough will be thick but sticky, which is okay since you will use more flour in the next step. Cover loosely with plastic wrap and refrigerate for an hour. After the dough has rested, fill a small bowl with flour and dust a plate or board with flour as well. Use a teaspoon or your fingers to pull off a small ball of dough, roughly the size of a cherry. You can make them slightly smaller or larger as long as the size is consistent throughout your entire batch. (You want them to all have the same cook time.) Roll the small dough ball in flour to coat and then pinch into a rectangle or football shape. Place on your floured board and continue this process until all your gnudi are formed. You can rest the gnudi at room temperature or in the fridge for up to an hour until you’re ready to cook. To cook your gnudi, cover the bottom of a large skillet with olive oil, grapeseed oil or butter, 1-2 T., depending on the sauce you plan to use. When the oil is heated/butter is melted, carefully place the gnudi into the pan, being careful not to crowd them; cook in batches if you have a lot. Depending on size, they will cook for about 2-4 mins. before being ready to flip. Like pancakes, they tell you when they’re ready; if they’re sticking, let them cook for another minute before trying to move them. When the first side is golden brown and the gnudi release easily from the pan, flip and cook for another 2-3 mins. on the other side to brown. (If they resist being turned, add a tiny bit of water, stock or wine to your hot pan; the liquid should steam them off the bottom.) When the gnudi are golden brown, toss with the sauce of your choice and serve immediately. 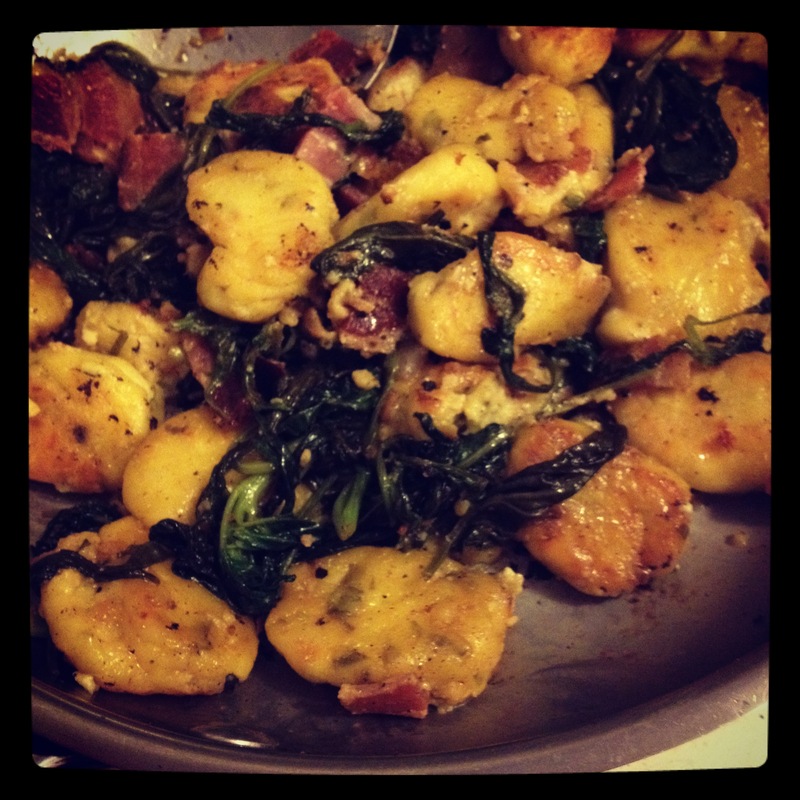 The picture above shows my gnudi just before serving: I steamed 1 c. fresh spinach and added it to the cooked gnudi with 2 slices of bacon, cooked and chopped, as well as 2 T. half and half. It was yummy!